If playing fetch with your dog is too tiresome or time consuming then you’d better consider investing in a cat, a python, or whatever. Even if you are a dog person, chances are you’re going to need some help with the exercise budget, so you’re lucky there’s technology available to help out. You can, for example get yourself an iFetch Interactive Ball Launcher . This strange shaped implement will happily play fetch with your pooch while you’re otherwise engaged. If your pet canine feels lonely most of the time, then this little robot will be his new best buddy. Load the hopper with balls and it will lob them to varying distances on a schedule. The balls that come with the device are a bit smaller than regular tennis balls, and you can either teach your dog to put the ball in the funnel for fully automatic rinse and play, or do it yourself. It’s a great device to have indoors or in your backyard to keep Milo (The Mask anyone?) busy. 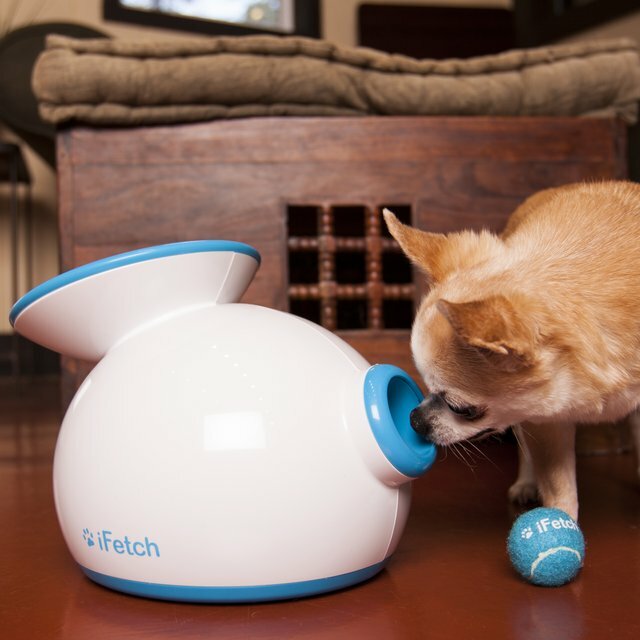 The iFetch Interactive Ball Launcher is available for $100 via Fancy.